This restaurant in Feldkirch made it to number one on Tripadvisor’s best restaurants in Vorarlberg, and so I wanted to find out why. It is situated on the river in the centre of town and was the former meeting place of Papa Chadha and his wife. They then renovated the restaurant and created a cosy dining experience where the motto is “where good food is culture”, and good food it was. 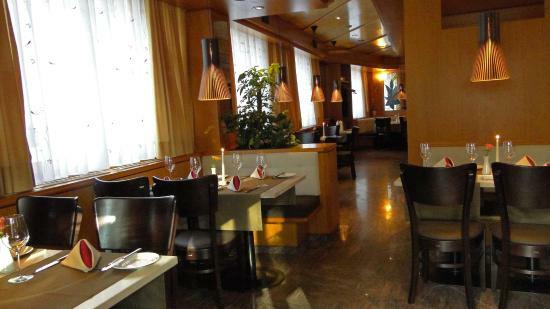 Don’t be fooled by the name, this restaurant serves up fantastic Austrian food. It was a miserable rainy night when we had made a booking, but as we entered we were greeted warmly and taken straight to our table. The restaurant is only small with the bar taking over a lot of the space in the middle of the room, but this does add to the cosy feel of the place. However unlike a lot of smaller places I have visited the way they have the tables laid out ensures you do not feel like you are sitting on top of the people at the next table. There are also tables outside which would be lovely to sit at on a sunny day overlooking the water. Browsing the menu they have weekly specials (promoted on their website) which included rump steak, lamb fillet and cordon bleu. The standard menu had a variety of main dishes ranging from pasta (vegetarian, fish or meat), pork or beef fillet, beef stroganoff, a large selection of rösti dishes (both vegetarian and non vegetarian), and the traditional schnitzel, as well as being complimented by a variety of salads and two soup options. 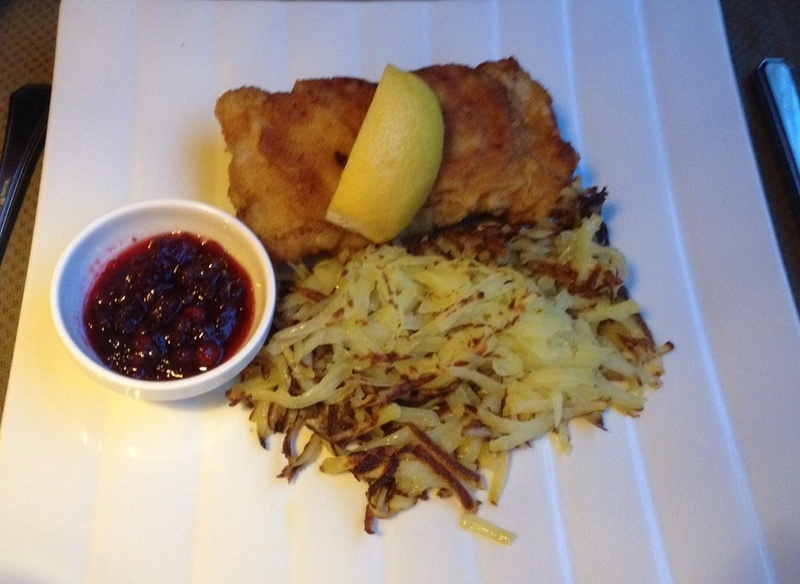 I opted for one of their two fish dishes which was served on a bed of spinach, with a mushroom sauce and had a side of pasta noodles, and Roger chose the cordon bleu which was from the pan and served with a cranberry sauce, rösti and salad. As we settled in with our drinks we were served some bread and then to our surprise we were served with an appetizer each compliments of the chef. This was smoked salmon with cream cheese on toast with a berry sauce drizzled over the top. This looked so pretty on the plate that we both dove straight in before I could take a photo, but believe me it was both beautiful and delicious. As the main event was served we had extremely high hopes. 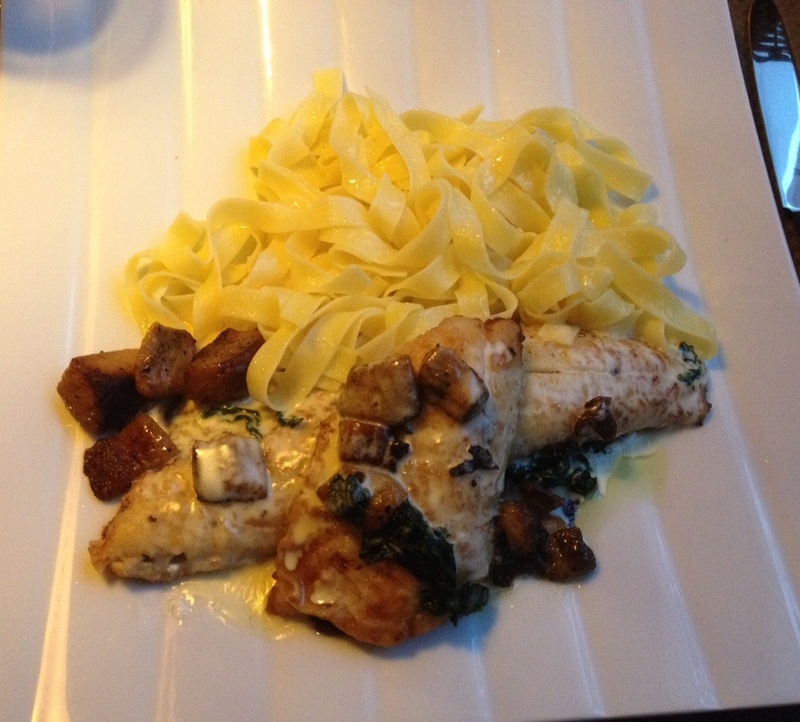 My fish was extremely well cooked and as a lover of mushrooms the fresh creamy sauce was fantastic. I am not used to having pasta served as a side dish in restaurants however these plain noodles were the perfect fit for the strong flavours of the sauce. I also tried Roger’s cordon bleu which was nice and crispy (yet not greasy), full of chicken and the cheese they used was amazi ng. Even his salad was not your standard salad. 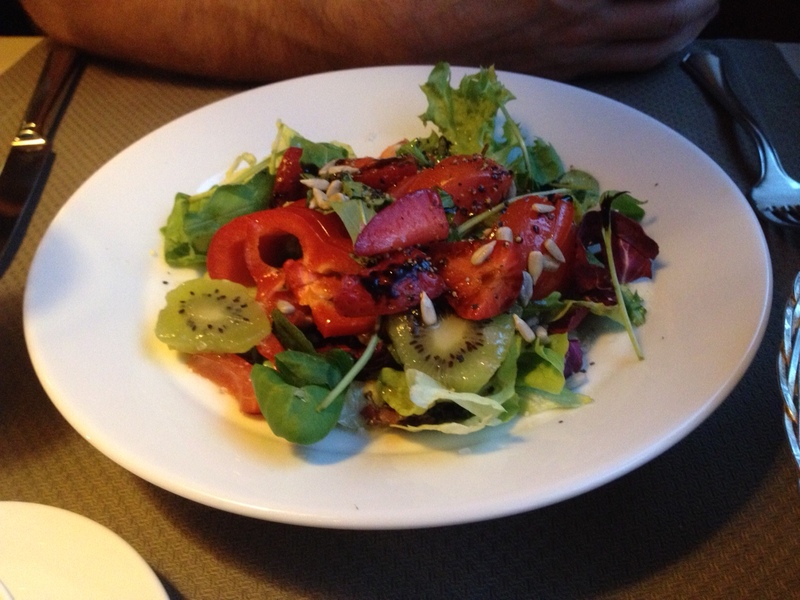 This had strawberries and kiwi’s mixed in which made it really fresh and tasty. 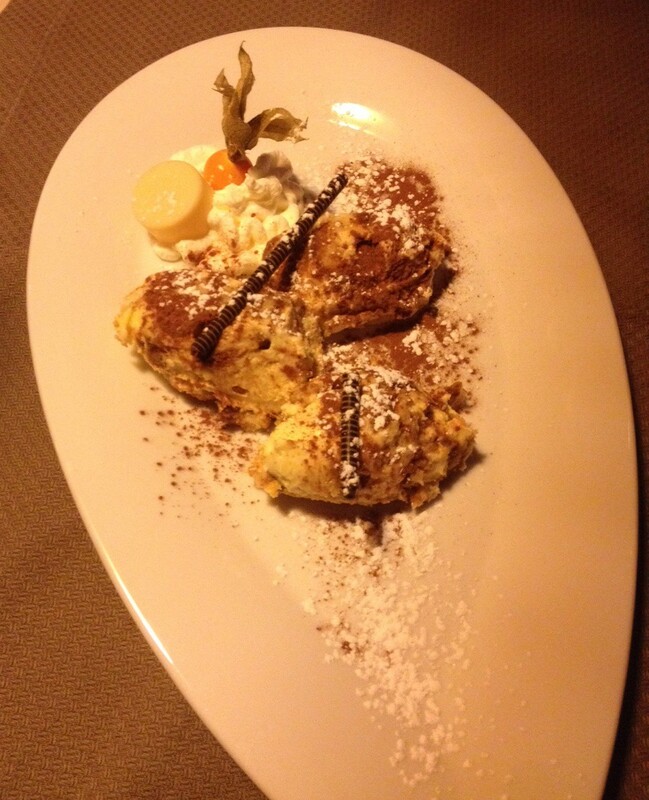 Even though we were both pretty full we were eager to try their desserts, and so we compromised on sharing a tiramisu. Not being in an Italian restaurant I always have reservations about how the tiramisu will be and as this is one of Roger’s favourite desserts they had a lot riding on it. As yet again a beautifully presented plate was placed in front of us we couldn’t wait to dig in. Straight away Roger commented on how good this was and I wou ld definitely agree, which had us fighting for the last mouthful. Neither of us left a single thing on any of our plates that night (we made plans to go for a long run in the morning) which really does sum up the quality of the food here. The menu is slightly more expensive than others in Vorarlberg with my fish costing €21 and the cordon bleu €17, however you are not shortchanged on either quality or quantity (as you can see from the photos) and I would happily have paid more for what we were served with. They also have a lunch menu if you work in the area. The only negative that I would say was the choice of music. Listening to Wet Wet Wet’s ‘Love is All Around’ played on the pan pipes and Celine Dion was not my first choice of dinner music, however for me the food won out and I can’t wait to come back.